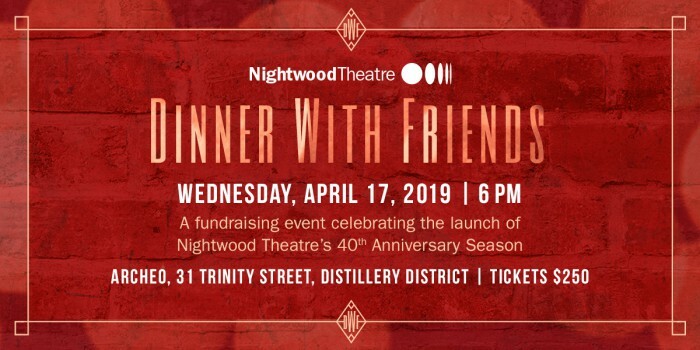 Please join us at Dinner with Friends, a fundraising event celebrating the launch of Nightwood Theatre’s 40th Anniversary Season in 2019/20! We will be enjoying an unforgettable meal in the company of our artists and supporters, as well as excerpts from Nightwood Theatre’s upcoming 40th Season. Come raise a glass to Kelly Thornton, Nightwood’s Artistic Director for the past 18 years, who will be moving on at the end of April to take the helm at Royal Manitoba Theatre Centre in Winnipeg; and join us in welcoming our incoming Artistic Director Andrea Donaldson! Tickets $250 each - a charitable tax receipt will be issued for the eligible portion of $150. All proceeds go to support Nightwood Theatre’s lineup of powerful theatre by women.